Is It Time For Your Dental Office Business Health Check? I’ve been reminded this week by a few instances that dentistry and owning a Dental Office is a business and not a hobby. As such, there are decisions that need to be made in business that are going to have to be made. There will be times at the Dental Office where we have to do what’s best for the business, and this may not be what is best for some or all of those individuals involved with the business. There will be times when reality has to overrule fantasy and imagination. I’ve seen businesses with so much potential go wasted because the owners have not wanted to keep employees accountable. I know of one practice that’s producing nicely but could still ramp up its production about thirty five percent with the introduction and implementation of measuring simple metrics. And in so doing those measurements they would be creating an accountability for those numbers. Sure, as it is, it must be a very nice way to practice, to just glide along on a wave…. But the way I see it, it’s like owning a Ferrari and never leaving the gated community. It’s a waste of potential. I’ve seen other Dental Offices where the staff have ever so slowly taken liberty after liberty after liberty in such a way that the original parameters and systems are a bygone memory only compared to the situations that those Offices have now found themselves in. And its when this gradual slippage occurs that we realise that the business is now operating to suit some of the employees, maybe, and not, as it should be to be looking after the best interests of the business and of its customers. Because a business operating in spite of itself is not a healthy specimen, really. It’s just chugging along on three cylinders, rather than sailing along full steam ahead with all pistons firing in harmony. And in this sort of situation, the business could really be hanging by a thread if the way things are being done aren’t changed. In these interesting times, there can be no coasting. In Australia, with the large increase in the number of graduates from newly formed Universities and also the large number of overseas trained Dentists now being given licenses to practice, competition for the dental dollar has never been so steep. And it doesn’t look like it’s going to get easier for some time. Throw on top of that the corporatisation of dentistry as well, and its impact on private practice, and you realise that only those practices that take control of their destiny with both hands will truly be successful in the long run. Despite these thoughts of peril in our future, there will always be people out there who will be willing to spend good money on our services because they believe our services are extraordinarily worth it. I heard just recently, that in society across the board there will always be twenty to twenty five percent of people who will be happy to pay for a service without even wondering what the competitors charge, because they believe that those services represent exceptional value. And this is why there is always a Four Seasons Hotel. This is why there are always Mercedes-Benz dealerships. As a dentist you need to do what you need to do to stand out head and shoulders above your competitors. And that means running your business to its best capabilities. Like the well-oiled machine you know it can be. The Ultimate Dental Handover is the heart of your dental business. Poor handovers result in confused patients receiving unclear directions and messages as to what their next step must be and more importantly, why that next step needs to be performed. A patient with clarity makes an appointment and keeps the appointment. A patient without clarity does not make an appointment, or makes an appointment and then either does not attend or cancels or reschedules. And so exists a “Dental Spectrum” within our practice. At one end, the right side, we have patients with total clarity. They understand exactly what they need to do next. They know when they need to come back. They know what they will be having done and why it needs to be done. They understand what will happen if they do not have the treatment done, and what will happen if they do not have the treatment done in the recommended time frame. And they would like to receive a call from your office if a vacancy in your schedule arises so that they can come in sooner. At the other end of the spectrum, on the left side, is the confused patient. They are numb. Sometimes mentally as well as physically and facially. They do not know what treatment they have just had done, nor why they have had that treatment done. They kind of know they have to come back, but they are not clear as to why they really need to, because nothing is hurting. They think that whatever it is can wait, sometimes forever. They have no idea of the consequences of delaying or deferring their next treatment appointment. Everything we do in our Dental Office either moves our patient away from clarity or towards it. So we must make sure that all our words and actions and intentions with our patient are directed to move them to the right hand side of the spectrum. Our service must be world class to promote the environment of clarity. And they like people who take time with them and spend time with them. And they do not like being ignored. And so we ourselves need to be one hundred percent clear on what we need to do for our patients. And that is we need to handover our patients following treatment with one hundred percent total clarity. Exactly what treatment the patient received today.How many fillings, how many surfaces, how deep those fillings were, and if there was any changes to the expected treatment that was scheduled to be done, such as increase in filling sizes due to the location of additional decay, etc. Exactly what the patient may experience or feel over the next few days following treatment.The Dentist needs to tell the patient of any possible feelings they could expect following treatment. This way, the patient is prepared for possible any and all post-operative feelings and experiences. Exactly what treatment the Patient will be having at their next visit to the Dental Office.Which teeth are to be treated, what is wrong with them and what that treatment will be. The time frame or urgency of the remaining treatment required.It is the Dentist’s duty to inform the Patient when exactly he next wants to see the patient. The Dentist’s role here is to create urgency for the treatment as opposed to creating a *Lack of Urgency* in the Patient’s mind. Creating urgency assists the Front Office team members in securing the next appointment for the Patient. Exactly what will happen if the next treatment is not carried out.The Dentist must inform the patient of the consequences if treatment is not carried out. The patient must understand that taking action is imperative for them. And that delaying action will be harmful to them. When your Ultimate Handovers begin with these five clinical points you dramatically increase your patient compliance and treatment acceptance. Patients leave with much better understanding of what their Clear. Next. Step. needs to be. Having an orchestrated sequence of Ultimate Handovers of the patient as they journey from the treatment room to the Front Office improves that understanding of what to do next even more so. Failing to Handover well and often promotes confusion. Consistent handovers strategically repeated create clarity for your patient to proceed with their next appointment. 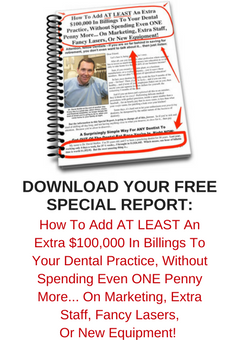 I’m often asked about incentives and bonuses for Dental Office employees. Is there a consensus as to what works and what does not? When we keep accurate records and measurements of trackable numbers, it makes logical sense to share the resulting improvements with those who helped achieve those improvements. And what gets improved upon gets rewarded. And what gets rewarded gets repeated. Why would anyone work harder for no reward? It makes no sense. What incentive is there to improve? If you’re going to be paid exactly the same no matter what the results, then of course this form of measurement, or lack thereof, will result in an application of minimal effort by those involved. And to expect anything different is absolutely ludicrous. And so, of course, if results that are measured then improve, it follows that things are better and therefore those responsible should be entitled to some celebration. And it’s amazing when I look at Dental Offices that pay employees various bonuses, there’s an air of improved harmony within those offices compared to Dental Offices that do not pay bonuses. And failure to incentivise deflates. One of my clients has several bonus systems applied to a host of measurements in her Dental Office. What this means is that at most times there’s the opportunity for staff to be rewarded for improvement. Bonuses in her office are paid on a wide range of parameters. And I’ve never seen such a great bunch of motivated employees. The bonuses create significant stake holding within the team. Great bonus systems need to be achievable. A good bonus system needs to be a stretch, but not an impossibility. I like to think bonuses should be achievable at least twenty five to thirty three percent of the time, if not more. So if we’re comparing on monthly figures, I’d like to set a target of last year’s collections plus fifteen to seventeen percent as a threshold for our bonus. Achievable, and definitely worth rewarding. If your office is collecting fifteen percent more than last year on a regular basis, then of course you wouldn’t mind rewarding those who helped with this improvement, would you? And of course, on the flip side, when an unachievable bonus system exists, it tends to deflate the team more than not having any bonus system at all in place. Paying bonuses is a great way of profit sharing with your key employees, and stakeholders. It’s amazing how the wonders of technology can shoot us in the foot. with little or no respect for the current patient already in the chair. This scenario floored me when I went to work for a dentist located near my farm. You see, what was happening here was the use of technology was being allowed to override people to people communication. Instead of a human being coming into the treatment room to courteously announce the arrival of the next patient, that practice had allowed their dental software to replace the human communication. Which meant in fact, that the offending Dental Assistant was literally clock watching the appointment book on the computer monitor rather than giving her undivided one hundred percent attention to the current patient at hand and also to her dentist. Hardly inspiring stuff from the patient in the chair’s point of view, I’m sure. In the same way that technology here was used to create a Customer Service System Fail, I’ve worked with Dental Offices that have allowed technology to take over after the treatment is completed, with a resultant negative impact upon the patient. Again, I have written previously about a Dental Office I worked with where the patients were brought out from the treatment room with only a request for an ongoing appointment length, and no mention at all about the treatment or experience just received. I know of another practice where patients leave the treatment room unescorted, and make their ways to the front counter, where a pop-up message on the receptionist’s computer is all that is relied upon to handover the patient to that receptionist. And is it any wonder that this scenario produces significantly lower re-appointment rates? All of a sudden there is no human-to-human communication to personably transition the disoriented patient from the horizontal treatment position to the now standing, vertical reappointment and money extraction position. It leaves me cold just thinking of the supposition that some geek made to think that this scenario was indeed even appropriate or acceptable? And yet like lemmings the dental profession has accepted this as the best available modus operandi? It’s about as personable as having to leave your table at a fine dining restaurant and having to go to a counter and place your food order and be given an electronic buzzer to return to fetch your meal when it was cooked. Sure that technology is present at your local pub maybe, but is it used at fine dining where you’re actually being served? I say the number one reason that our valued dental patients leave our Dental Offices and seek treatment elsewhere is because of apathy and perceived apathy from our staff and our team and our dentists towards those valued patients. Don’t allow technology to purvey apathy towards your valued customers. Wherever possible allow human beings to respond and interact with your paying clients rather than automation. How do children spell “LOVE”? And our patients spell it exactly the same way. Want to see your case acceptances rise and your cancellation numbers plummet? Spend TIME with your patients. How Badly Does Your Dental Business Want To Improve? There’s a real trust required when being an employer. You need to be able to let people do what you employ them to do. It’s the same for employees. Employees need to trust each other and their employers that things are being done correctly to the standards that they need to be done. Dentistry is one of those businesses where a lot of trust needs to be given. Because the owner of the business usually has his back to the employees for most of the day. Unlike normal businesses, like retail, where the owner walks the floor in a supervisory role, in dentistry the owner is the one spinning the wheels, at the coalface all day long, so to speak. And so by its very nature, dentistry can attract the lazy and deceiptful to it as employees. On the contrary, its always a pleasure to meet dental employees who are self sufficient go getters who have the ability to work productively and efficiently in an unsupervised manner. These self-starters are a true pleasure to behold. The trouble is, as a dentist, once you’ve been subjected to lazy employees, it can kind of tarnish your view of employees. The trust can be eroded. And that trust in human nature can take some time to return, if at all. It’s sad because most people are inherently honest, on the whole. Or do they reach a point of “coasting”? A point where they decide that enough effort is enough. A point where they decide that they’re comfortable and they don’t need to and don’t want to go that little bit extra any more. That they’re not going to bother going that little bit extra any more. We all have seen it…employees who reach their own personal glass ceiling. I’ve seen Dental Offices where the business could really do with some simple improvements to take it to a new more productive level, but the Dentist Owner tells me that they’re happy with where things are at the moment. And so simple opportunity is lost. The opportunity to take some easy growth is declined. And it’s usually because the employees of that Dental Office have reached a state of equilibrium, and the owner is fearful of a mutiny if he disturbs that status quo by suggesting more duties that may require an emotional stretch. And this would be because that stretch would be required by the unsupervised. Sometimes the necessary stretch is required by the dentist. In just the same way that it was uncomfortable learning how to drill plastic teeth, so too will it be uncomfortable in learning how to be a good manager and a good businessman. So how do great Dental Offices come to be? It’s a matter of like attracting like, I guess. Strong leadership attracts strong team members. But to a point of balance. Nobody likes to work for a dictator or a micromanager. But a dentist who wilts in the sun like a sunflower on a hot summer’s day is not a good employer to work for either. Great Dental Offices morph into greatness over time. The pursuit of greatness is not a quick fix. But it can be achieved over time. It requires a little stretching by all. Not just one or some. But improvement can be achieved, in every case. It’s just how much improvement is wanted.